Dominance and depth on the defensive line were integral to the unprecedented success USC had in the 2000’s under coach Pete Carroll. While the Trojans (5-5, 4-4 Pac-12) have continued to produce standout defensive linemen such as Leonard Willians following Carroll’s departure at the end of the 2009 season, USC has not had the overwhelming talent in the trenches that allowed Carroll to deploy waves of productive run stuffers and pass rushers. Coach Clay Helton wanted to address that issue in USC’s 2017 signing class, bringing in four defensive linemen, with Lichtenstein coming to the West Coast from Weston, Florida, to join the three big men recruited inside the Pac-12 footprint. Tufele and Tuipulotu knew each other as two of the most sought-after recruits in the country. Pili, who was born in Alaska but moved to Oregon for his final year of high school, and Lichtenstein were not as highly regarded. However, they immediately bonded and realized the immense potential of the group as soon as they arrived on campus. 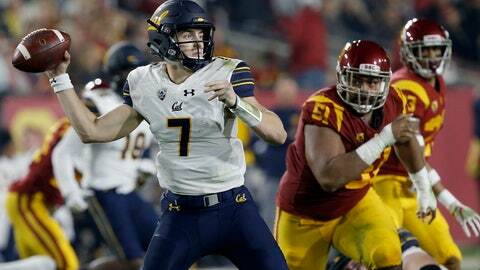 Pili was the only one of the four to play extensively as a freshman, making 14 tackles and blocking a field goal to help USC win its first conference title since 2008. Tuipulotu took a medical redshirt after appearing in three games before sustaining a back injury that would cause him to miss the rest of the season. Tufele and Lichtenstein were both redshirted. All four have carved out regular playing time this season and have made their presence known in recent weeks. Tufele returned a fumble 48 yards for a touchdown against Utah and the four have combined for six tackles for loss and four sacks in the past two games — against Oregon State and California. Helton said they have been just as effective in allowing the inside linebackers to make plays in USC’s 3-4 defense. Occupying blockers and creating penetration will be keys against UCLA (2-8, 2-5) at the Rose Bowl on Saturday. The Bruins are averaging 155.9 yards rushing per game in conference play, and redshirt junior Joshua Kelley has run for 100 yards in five of seven Pac-12 games. Pili did not practice Wednesday because of an ankle injury, but expressed optimism he would be available against UCLA. If Pili is limited or not able to play, the rapid progression of Tufele, Tuipulotu and Lichtenstein has Helton confident USC has plenty of options to pick up the slack. NOTES: Quarterback Matt Fink (broken ribs) has resumed practicing this week, but Helton has not decided whether Fink or redshirt freshman Jack Sears would back up starter JT Daniels against UCLA.